5 minutes with… Ashley Barker – President and CEO, ProbeLogic. I have received many emails following my post highlighting the clinical impact of transducer damage. The feedback suggests that I wasn’t alone imaging in the dark and taking my probe for granted. To help answer some of the great questions from readers, I decided to get some help from transducer-guru and CEO at Probelogic, Ashley Barker. I am always blown away by Ashley’s knowledge in this area, and appreciate him taking the time to chat with Echo.Guru today. Hi Ashley, thank you for taking the time to chat with Echo.Guru and share your experience of transducers. Assuming we take good care of our probes, how long will a probe usually function normally? In other words, is there a reasonable life expectancy for our probes? Probes which require regular sterilization will have a finite life expectancy. Sterilization can cause chemical stress and increases the risk of impact damage due to the extra handling required. These faults can almost always be repaired, avoiding the large expense of replacement. For probes not requiring sterilization, generally speaking, if they are looked after and well cared for, there is no reason why they should not last for a long time. Probes are not a consumable item and there is no part of the acoustic pathway which will wear or fade with time. Some people have mentioned in the past that acoustic crystals become ‘old’ and not as sensitive with age. However ProbeLogic has accumulated acoustic data going back 12 years which evidently suggests that this simply isn’t the case. Whilst theoretically a transducer can last the life of the system, reality is often different. Even the most careful operator can accidently drop the transducer or the cable can be tripped on or run even over by the system. When these types of incidents occur, the gradual degradation of the image quality is to be expected. What are the most common causes of probe damage? Is it just old age and degeneration, or are we misusing/abusing our equipment? The most common faults we see on general imaging transducers are typically caused by accidental damage. Damaged lenses, cable strain reliefs torn from the head of the probes and damaged cable sheaths are all very common repairs passing through our labs. TEE (transesophageal echo) probes which are usually more complicated, often get bitten by patients or damaged during sterilization. These can cause punctures in bending rubbers, damaged/worn insertion tubes and mechanical drive problems, usually caused by impact damage. What are your recommendations for cleaning transducers after each scan? All transducers are different. Manufacturers usually have a list of recommended cleaning or sterilization methods for each of their probe models. If you don’t have this list, you can ask the equipment vendor and they will be able to provide it. Most sterilizing systems will also have a corresponding list of compatible transducers that have been fully tested on the system. So, if you are unsure of the recommended cleaning method for your system, the best option is to refer to the manufacturer. Do some cleaning products cause damage to the probe? Almost all probes will be damaged by continued exposure to alcohol in cleaning/sterilization. Unless the vendor has specified that it should be used, it is important that people do not use alcohol to clean or sterilize their transducers. How often should I get my transducer tested, assuming no physical damage, or trauma? Before answering this question it is important to understand that there are several methods which can be used to test a transducer. The use of a tissue equivalent phantom will not show the complete health of your transducer, particularly a cardiac phased array transducer. The phantom method is typically conducted annually by the equipment vendors and will not identify non-firing elements in a phased array transducer until the damage is well beyond clinical significance. The only successful way to test the acoustic pathway of a transducer is to perform a full acoustic test. This involves aligning the transducer in a water chamber with a special acoustic target. Each element is then energised individually. The resulting signal reflects from the target and is received again by the element. Data is collected across the face of the transducer and a full report can be produced. Based on our experiential testing of probes within clinics throughout Australia, a testing schedule performed annually is sensible for most transducers. If you are under a service contract or warranty from the equipment vendor, then testing annually may prove crucial to the health of your probe. If faults are found on a transducer, the equipment vendor is obliged to replace the transducer at no charge to you. Only ProbeLogic have the equipment and expertise to perform full acoustic testing in Australia. My advice would be if you are in any doubt as to the results given by your transducer then get it acoustically tested. I have run over the probe cable with the ultrasound system and I can see wires…is this repairable? Should I just wrap the transducer in electrical tape and continue scanning? Split cable with exposed witing. This is a common injury when the cable is run over by machine, or crushed against a bed/wall. This damage is very repairable at a very affordable price. It is important not to wrap cables in tapes, most tapes will cause chemical damage to the transducer cable and will increase the cost of the repair. If you have damaged your transducer cable in any way, we strongly recommend a repair as soon as possible. Electrical tape doesn’t fix the damage to internal wiring. It is like putting a band-aid on a fractured arm. 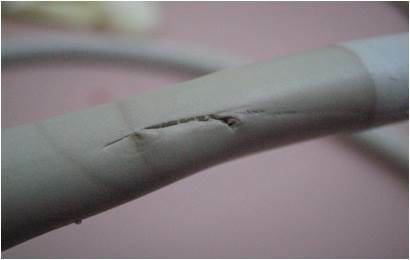 The chemicals in the adhesive often cause further damage to the cabling, increasing the cost of repair. Any extra tips to extend the life of a transducer? A big piece of advice is to make sure the cable of the transducers is not dangling around the wheels of the ultrasound. Most systems have hooks near the probe holders, these should be used to keep the cables off the floor and out of harm’s way. TEE probes are best stored unrolled (not in their box). Hanging the probe is the best method for storage, ensuring the tip cannot bang against the wall as people walk past or access the rack. There are some great storage cabinets available for TEE probes, some of which have a wealth of great features. Additionally, it is important to ensure that CSSD (central sterile supply department) fully understand the sterilization requirements and fragility of TEE probes. We see a large amount of TEE probes that have been damaged during sterilization. After washing or sterilizing a transducer, many people hang the transducer. It is of great importance that any remaining fluid is prevented from running down the cable and into the connector, as it will cause serious corrosion within the connector assembly. Best practice is to store the connector at a high point on the rack. Or alternatively, the operator can make sure the transducer is completely dry before hanging. Keep transducers in the holders of the machine when not in use. Placing them down on the bed between patients for example, even if only for short periods of time, may result in accidental damage to the transducer. Visually inspect and clean your probes on a daily basis, carefully removing any excess gel from the transducers at the end of each working day. If you notice any potentials faults i.e. cuts in the lens or cable, cracks in the case or bent pins in the connector, have the probe repaired as soon as you can. Repairs are going to be much more cost effective than having to replace the probe and will keep your transducer operating at optimum performance standards. Thanks again Ashley, for taking the time to answer these questions today. Read more on ultrasound physics in this text from Dr Robert Gill, “The Physics and Technology of Diagnostic Ultrasound – A practitioners guide”. *Some links on this site are affiliate links meaning, at no additional cost to you, I may get a small commission if you make a purchase. These small contributions help to keep Echo.Guru a free site. Thanks for your support in this way! At Echo.Guru I ONLY write about people and stuff I actually use and recommend myself. How much do you trust your transducer?? How long should an echo take? In my experience, accidental damage to echo machines, probes and cables is often the result of them being borrowed and used by people other than their regular users. When you rely on your equipment day in, day out, you tend to look after it better, resulting in fewer ‘accidents’. When ever the service is done on the machine, I often used to wonder, if they check the transducer in detail to make sure all the elements in it are working. Filters are cleaned . generally. Wonder if the companies providing service contract, have a protocol ?? Thanks for sharing. Good question. Most vendors will conduct a visual check of transducer and connections for damage. They also perform electrical safety testing looking for electrical leakage which can also be a sign of damage. Some vendors may also use a tissue phantom, although this can be unhelpful with phased array transducers; and it is actually pretty uncommmon for a phantom to be used anyway. The probe in the post “do you trust your transducer?” had 26 dead elements, but passes any of the vendor tests. Sophisticated testing interrogating individual elements is required to properly test the probe. Discovering this was a very sobering day in our lab! !